I had a delightful time cooking with the CCC Mill Street crew. For a person that burns everything in the kitchen, the only burn I got was not knowing where the Smart and Final is in San Rafael. Chef Jerry White had everything organized. Pierce and Lisa were fierce with the knives. Barb and Beth were cutting us up with a “Hey Girl” bit that was actually supposed to be “Hey Google.” (See SNL skit "Amazon Alexa Silver" for reference. Click HERE to see the skit​.) Lastly. all-star Penny Clark was back in action lapping us all with her eighth year of participation. Food indubitably has a way of bringing us all together. On September 11, our minister David Gregory was one of two ministers and 30+ others who addressed the Marin County Board of Supervisors, advocating for a simple renter’s protection: the landlord must tell the tenant why he or she is being made to leave, and the reason cannot be because the tenant asked for repairs of substandard conditions which many tenants now have to bear, e.g. mold, broken windows, broken appliances, etc. A majority of supervisors indicated that they are inclined to support some form of a Just Cause Eviction ordinance. This type of tenant support is critical in our very tight rental/housing market. As a member of the Marin Organizing Committee, CCC is at the forefront of protecting the most vulnerable members of our community: elders on fixed incomes, the disabled, immigrants and service workers. As a community of faith, we are called to this work, and we are proud to be a part of it. Click here to read an excellent article from the Marin Independent Journal regarding this event. This event happened on short notice, but the urgency was that 60 families suddenly found themselves at risk of homelessness because they were given a 40% rent increase effective September 1st (and this for a building with mold, faulty doors and windows, and rampant infestations of bedbugs and cockroaches). MOC gathered and rallied to shine a spotlight on this unacceptable situation. The intention was to exert public pressure on the property owner and to stand together to protect our most vulnerable neighbors, and it worked! The new owner agreed to a gradual increase in the rent over a two-year period, with increases set for specific dates. The owner also agreed to make repairs to bring the buildings up to code. This gives tenants time to make future plans, and allows for the children to stay at their schools this year without the disruption of moving. Members of CCC marched in solidarity with hundred of others in protest of the separation of immigrant children from their parents. the United Nation's World Refugee Day. April 26th was the last night CCC hosted and fed the guests from REST, and it seemed important to have a parting ritual, a gentle and caring goodbye. All CCC and Christian Science Churches folk who have volunteered for REST were invited to meet in the church office at 7:45 PM, and once gathered, they walked to the chancel area as a group and sang the following chants: "From You I Receive," "May the Blessings of God Rest Upon You," "Go Now in Peace," "Ubi Caritas." The group then quietly left via the office. Our guests were given a Starbucks gift card as a parting gift,something they deeply appreciated at the end of last year. Here is a picture of most of the CCC folks who attended the REST procession/press conference/vigil. Twenty-five CCCers showed up for this important event, including our minister (many others had wanted to attend but had prior commitments). CCC's presence tonight celebrates how our CCC community supported and supports our REST guests in receiving improved services in the future. We literally and figuratively "walked our talk," not just tonight, but for the many years we have been part of the REST program at CCC. I could not be more proud to be a member of our church. 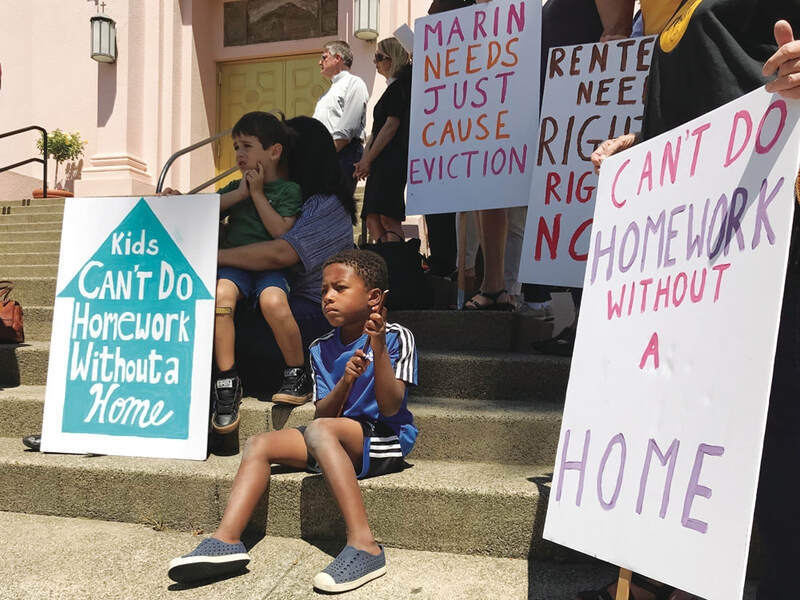 Click here to read an article from the Marin Independent Journal about this event and the movement to find a new approach to homelessness in Marin. Several CCC members attended a gathering of the Marin Organizing Committee in the gymnasium of St. Raphael's church in support of educational equity. The Superintendent of San Rafael City Schools and members of the School Board also attended. The agenda included listening to parent and community stories and gaining commitments to work on the issues affecting children's well-being. One attendee from CCC wrote: It was an excellent beginning, I think - and heartwarming. It was . . . mostly in Spanish. We had translating earphones. This picture shows a lovely girl sharing her reality . . . . The Board members are on the stage. We broke into small groups and heard everyone’s story and difficult issues, which are mostly about lack of adequate housing and fears of ICE. [There were] . . . lots of articulate, bilingual teens sharing about their hard life circumstances. The schools must be doing something right for a number of those young people. Also, the School Board members and Superintendent were very gracious, and invited more participation and feedback. Two spoke in Spanish. In March 2017 CCC members and friends filled backpacks to be distributed to immigration asylum detainees upon their release from a local Detention Center. When detainees are released, they may need to travel by bus to a faraway state. They have only the clothes they were picked up in and no personal belongings. The backpacks provided a change of clothes and personal care items to get them wherever they were going until their hearings. With donations from many businesses and individuals, we created over 40 lovingly-stuffed backpacks, each containing a change of clothes, toiletries, and a personal note. Thanks to all who participated in this caring project! in support of some of the causes that are important to them.